Just received a roll of Mr.Mikes dark grey#08 leather-ette. 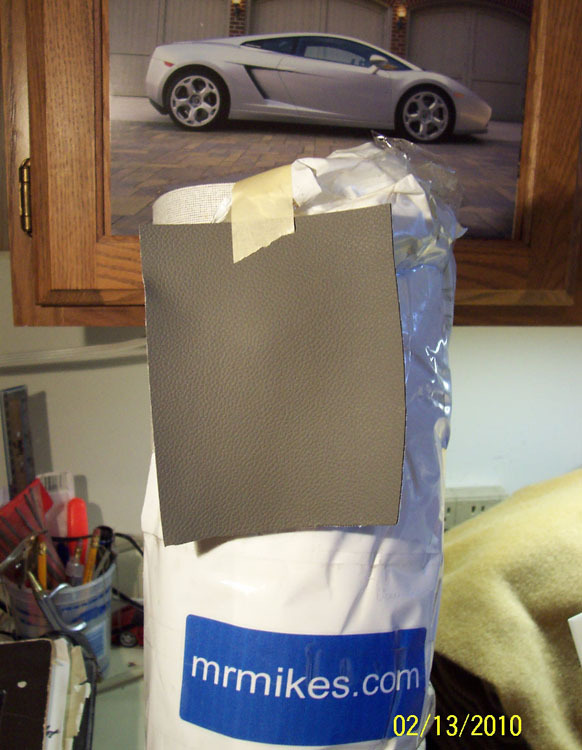 This will be for the next Fi355 interior I'm doing in black/grey for a stock Fiero. 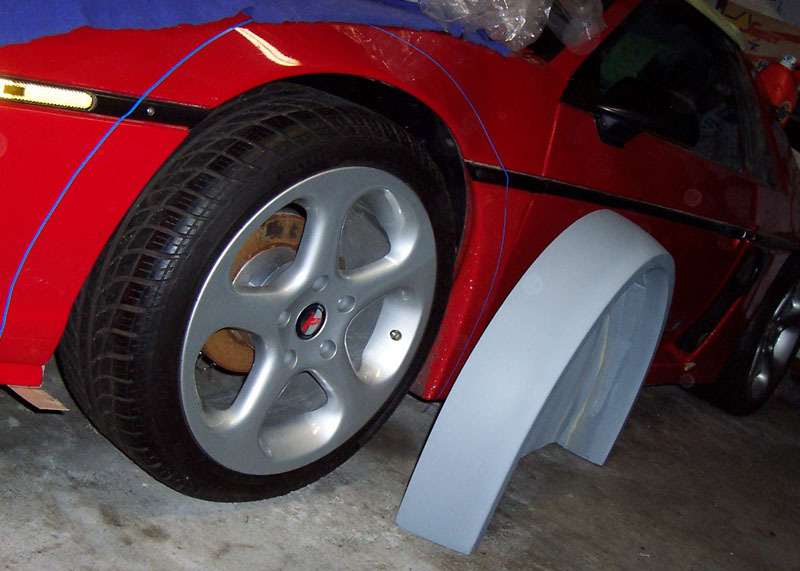 The fender flare that I'll need to cover my Porsche wheels will be about 5.5" wide at the top ( front wheels ). Hey Rob, nice work as usual...Question about the Porsche wheels? If the wheels extend out so much, aren't you going to really increase the scrub radius a huge amount? Bob, The wider Porsche wheels with the adapter will increase width by about 2". But with the higher offset of the Porsche wheels the centerline moves outboard by only 20mm compared to the center line of the stock wheel. By switching to a 3/4" adapter (absolute minimum) the centerline will only move outboard by 13mm. 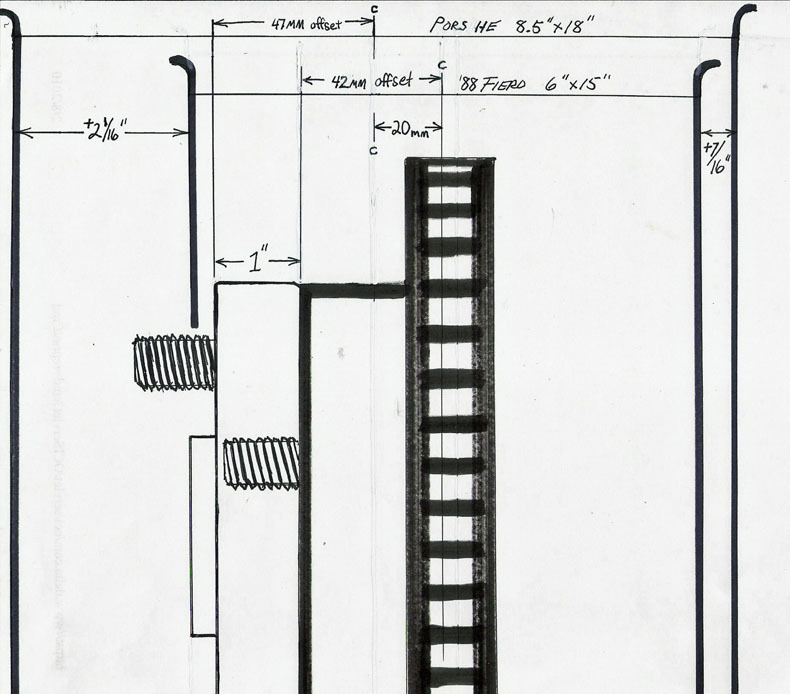 This diagram shows measurements. 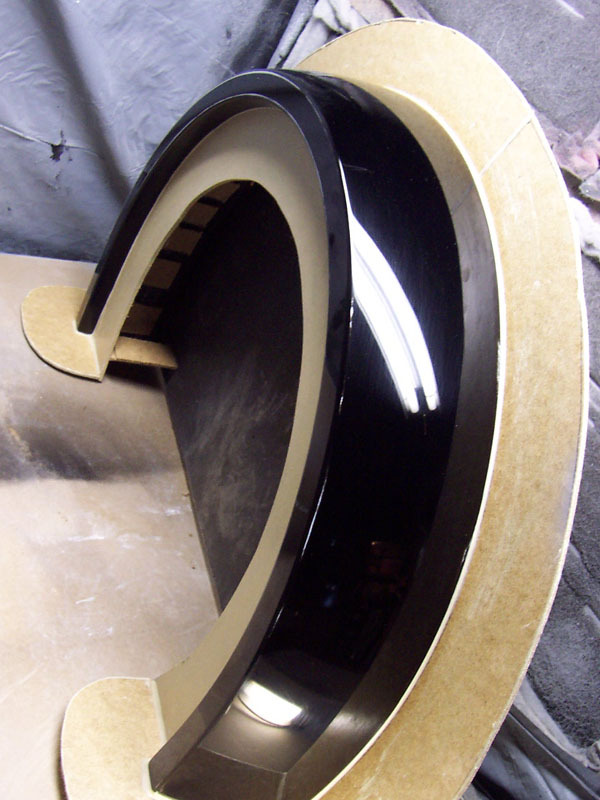 Onto the universal fender flare, a black lacquer top coat was applied which will next be polished & buffed before the tooling process begins. Being that this is not specific to any car make/model this may be of value to a few car builders within the general automotive universe. Awesome work... any pictures of how that flare lines up in the rear? Haven't gotten there yet, but once I get a part made I'm sure , on the rear, it'll be more pronounced from the rear view than on the front side. Thanks for offering. I'd like to see at least 5 people who want the fi512 nose. It still won't cover my cost, but perhaps it'll create more interest. depending on total cost I would be willing to pay deposit and make payments to full cost untill there ready! p.s. what would the full cost be? What would be the customer cost for the nose ? 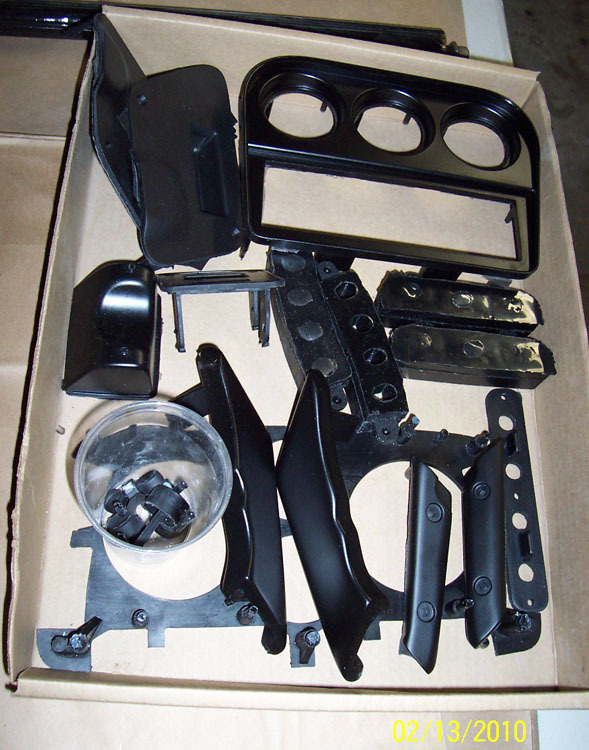 Probaby $550-$600/unit to fabricate. It'll be a nice one to do, but I should probably start a thread to find out if there's enough interest before investing a month's worth of work. Anyone interested in this Fi512 nose should PM me. 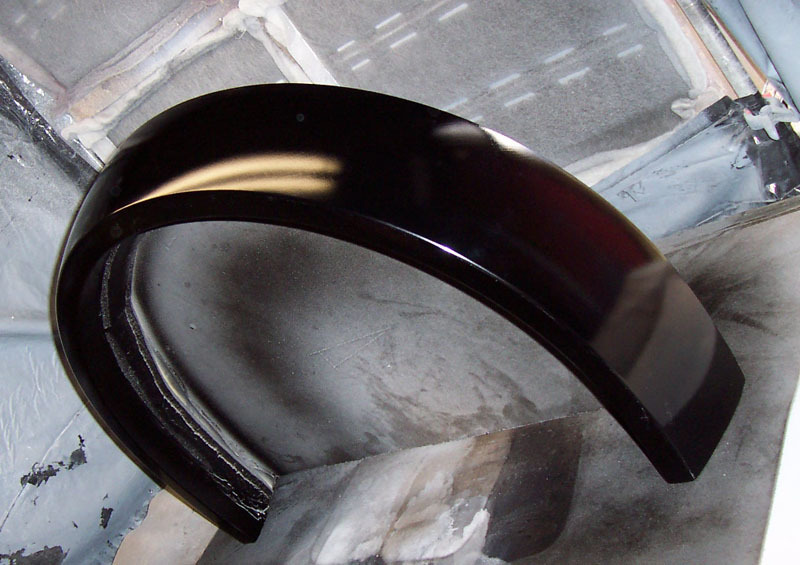 Fender flare model is polished & waxed with flanges attached...alot of work for just a little item like this. Amida was just talking to a friend, who also does fiberglass work, and we both agreed that most people have no idea how much work it is to make molds for parts, even small ones. Right, & the time & material you invest is out of your own pocket which you may never recover unless you make the minimum required units to breakeven...something that may be just a pipe dream nowadays in the Fiero space. Test fitting new front fender flares...might need to trim another 1/4-1/2" to close the gap a little more, and maybe lower the suspension a little more as well. Damn you Amida! I just bought wheels last summer. Guess I will need to save my pennies for some fatter wheels. those flairs look awsome and for some one who wants a wider look without tearing appart the whole body, or who wants to try making their own widebody but with a little head start....those would be an excellent start. i like the look. 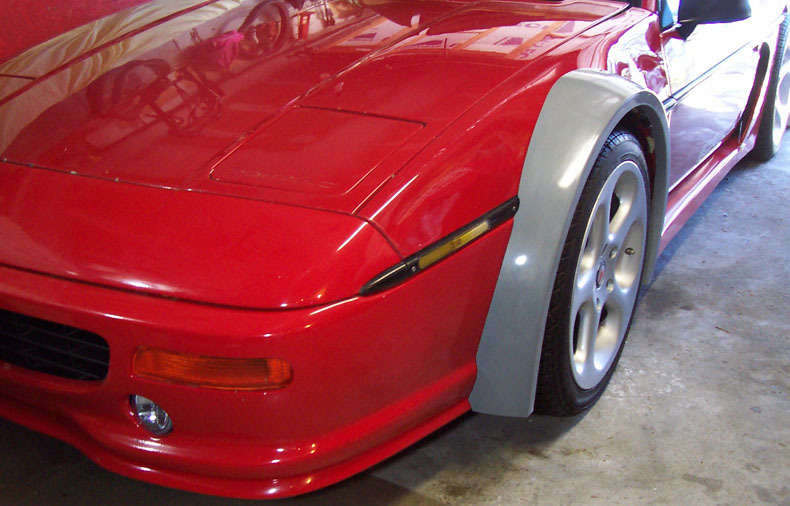 but i would try to mold that front clip onto the fender flairs. 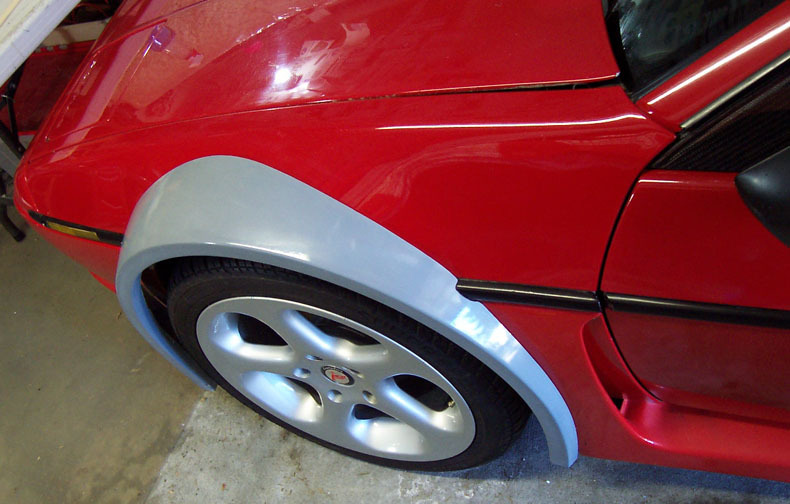 That's what I'd probably do if the fenders were made of fiberglass, but then again attaching with hidden fasteners without doing a whole lot of bodywork is the simpler approach. 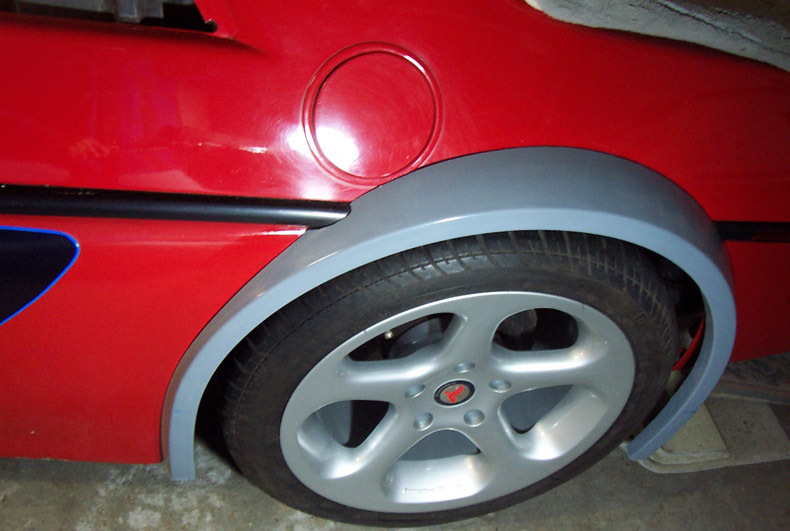 I'd like to find a rubber seal from another oem car/truck that I could use to finish the edge. I saw a Toyota trd tacoma truck that had flares with rubber seals...I'm wondering if I could use that for this application. Shaved down another 3/8" from the flare. I think it's on the money now. I've got 18s on right now, you could probably go up to 19s with rubberband tires. Did you start your build thread yet? I was going to suggest you shave them down some, but you are already ahead of the game. Looking good ! Yep. Might shave a little bit more to get more angle. That's looking to be a nice combo. Your fender look like a fiberglass part, is it from Fierowarehouse? 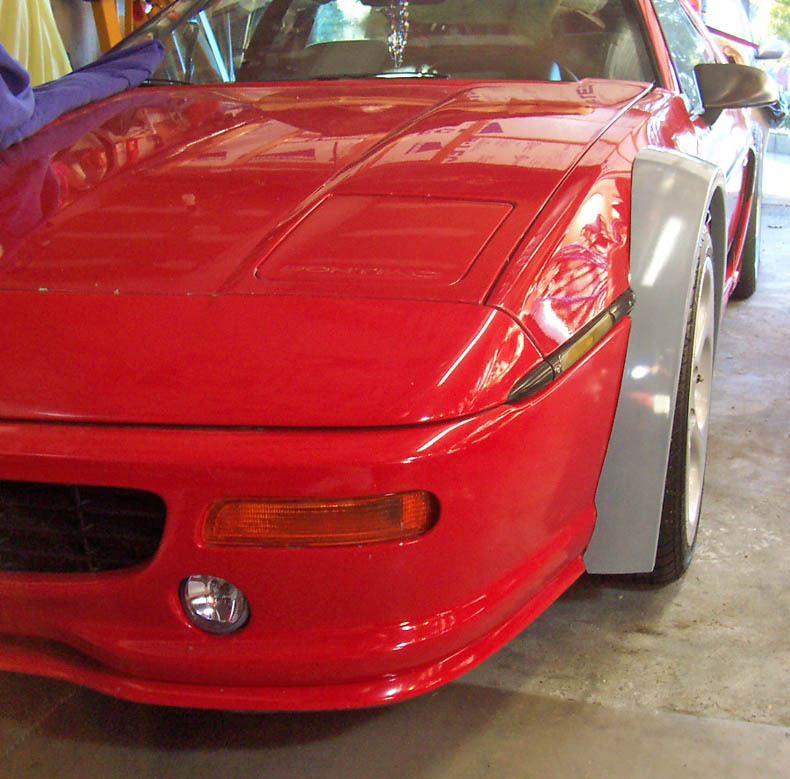 Thinking of tying it into my enzo side scoop idea. Today, I laid up another one for the rear. Thanks. 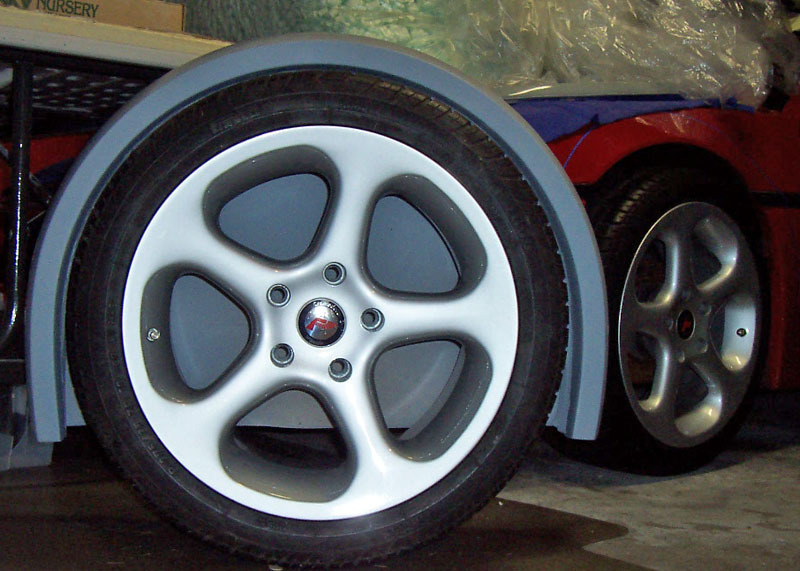 the fenders are part of the mad arch wide body kit and yes they are fiberglass. 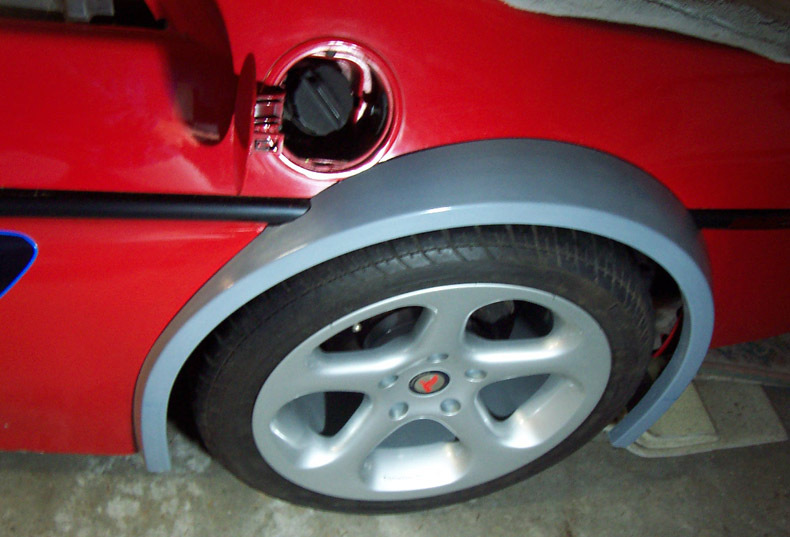 I'm pleased that the rear fender flare doesn't interfere with the fuel door. It won't need a notch or dimple. Those look awesome! Lets see some pics of both mounted together front and rear. Or the rears from further away! 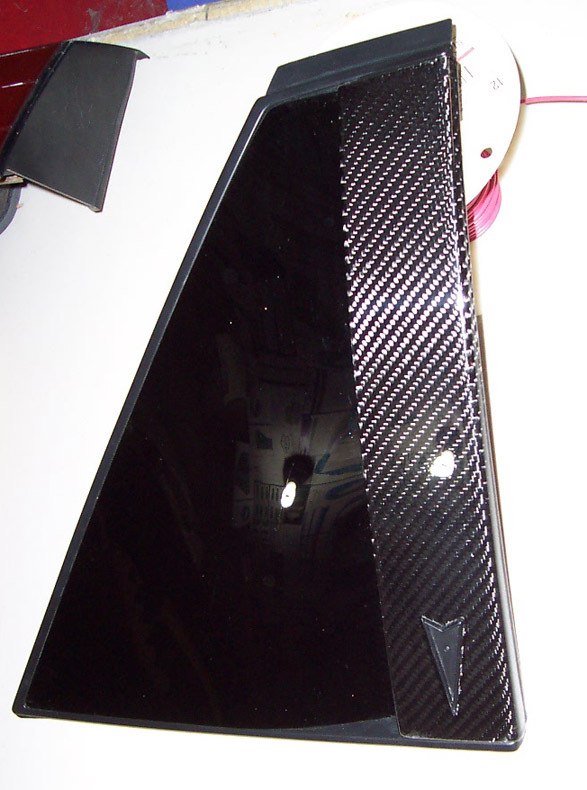 The refurbished sail panels are just about ready to be re-mounted onto the Formula. New sails from FieroSails, a fresh coat of paint and my prototype carbon fiber B-pillar caps. The only thing missing are new arrowheads which I believe are still available at the Fierostore...I'll have to order a set. I scuffed up the two surfaces to improve adhesion and applied beads of silicone gasket leaving a gap at the bottom for water drainage. Very nice! Nice job as always, Rob. the fender flairs look great. I'm going to lower the front a little more, and since these flares will not be moulded in I'm tweeking the bodywork to add transition lines. Thanks. I still have to fix the clutch to get it back on the road. 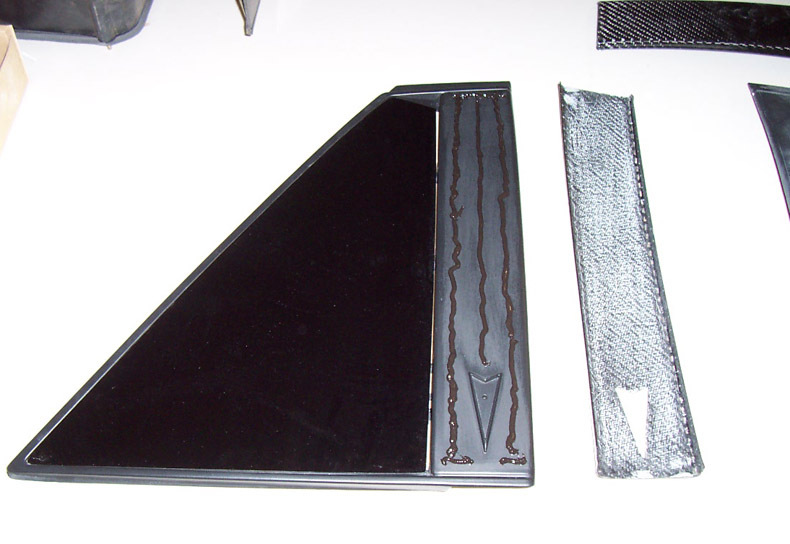 What material do you use to bond the fiberglass to the plastic door panels?